He goes by Windpipe. And let me tell you, he definitely lives up to his name. His voice is something magnificent, like if Rhodium and Technetium (Windpipe and Goldenboy’s favorite metals) fused together and rode down a rainbow highway with sprinkles coming out of the exhaust. I apologize for the crappy spy shot but it was taken outside looking into the venue. This entry is filed under miscellaneous. 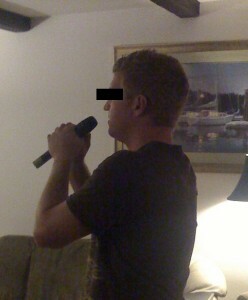 And tagged with rock band, windpipe. You can follow any responses to this entry through RSS 2.0. Responses are currently closed, but you can trackback	from your own site.